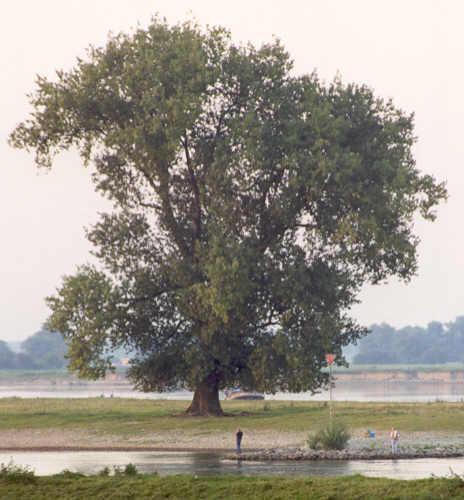 On a peninsula in the river IJssel near Zutphen this majestic Black-Italian Poplar (Populus x canadensis 'serotina') stands. It is one of those large old poplars wich have been left growing along the river-banks. Elswere most poplars are cut before they are 40 years old, their value is only economic, but here they are forgotten and left standing to grow big and old. While they grow faster than any other tree in our climate, they become in a century as big as other deciduous trees in two or three. This one is about 100 years old , stands 30 m (100 feet) tall with a girth of 6,5 m (21� feet). The biggest I know in Holland is 33 m (110 feet) tall with a 7,5 m (near 25 feet) girth, also not far from Zutphen. 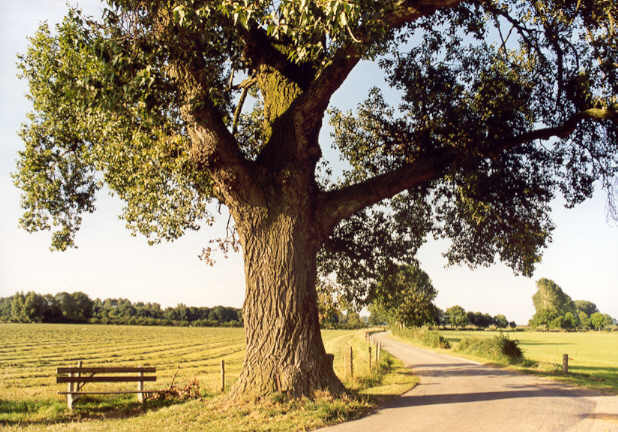 This is an original Black Poplar , ( Populus nigra ), near a nice little village called Voorst, near Zutphen as well. The original species has disapeared nearly totally from Holland for two reasons: the original riverine forests where it grew were all cut in former centuries and for commercial wood-production the Canada hybrids were prefered, because of their faster and straighter growth. This individual (circumference 5 m.) must be about 100 years old. A very beautiful Oak and some nice Lime-trees in the IJssel rivervalley north of Zutphen. Not far from Zutphen is the vilage of Brummen. Here lies the Estate called "De Engelenburg", meaning "The Castle of Angels", wich now is a mere hotel-restaurent with golf-course. Near the gate this big Purple Beech is looming, once more one of the realy heavy Beeches of the country. The Park has some more nice trees to offer: a Sequoia , a London Plane and a big Taxus stand out. The beech has few days left: the crown is getting thinner each year. The owner writes on a table it is 350 years old, but this is at least a century to much, for sure. Height: 30 m ( 100 feet), girth: 6,9 m (22' 8" ). Along the river IJssel, south of Zutphen, lies the nice medieval town of Doesburg, its tremendous tower showing miles away . On the old cemetery stands this big Purple Beach wich shows very well it was grafted on a rootstock. Grafting is often done with special tree-varieties, of wich it is difficult to obtain pure seed. 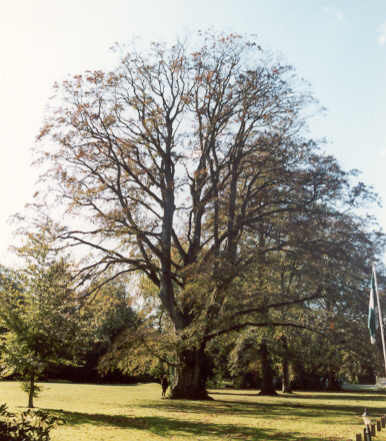 The rootstock is most often of the original wild ancestral type, in this case the common green beech. Here the rootstock has grown a lot faster than the graft: below the fusion the trunk has a girth of 7,9 m ( 26 feet ), above it of only 5,3 m ( 17 � feet ). In girth this is at the moment the champion of all Dutch beeches. 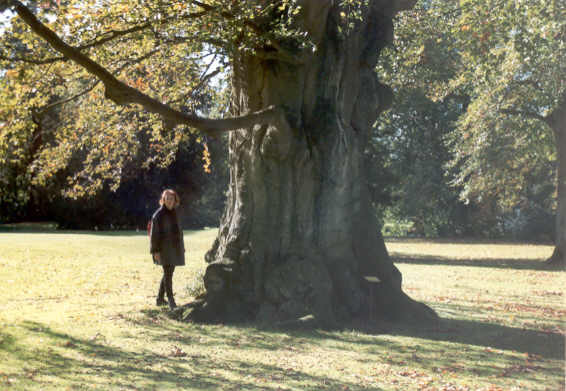 The tree has probably been planted around 1775, so is now about 225 years old. Alas its top is dying off the last few years.